An illustrated guide to repainting – No Nap Time! This tutorial does not apply to the Ghoul’s Alive line. A Different type of plastic is used for the line’s heads. Using Acetone will result in melting the plastic. Since my photographs aren’t always the best references, I made an illustrated version to better show what’s happening during my repaint process. Be sure to check out my previous post on how to prep your doll for repainting, and the tools and guidelines. It’s better to measure twice and cut once so if you aren’t quite sure what you’re going to do with your doll, sketch it out. The face sculpt you choose is essentially a canvas that will dictate or limit what you can do. The sketch doesn’t have to be accurate but just think of it as a blueprint that you’re going to try to follow when you start repainting. You can also use your sketch as a reference to keep you on track if you aren’t working from a reference photo or illustration. For example, plan on limiting the sealant layers that you’re going to use. You know that you have to reserve at least 2 layers to prep and another for the blush. The next few layers will depend on how comfortable you are on drawing hard areas such as the eye lashes, eyebrows and lip detail. Use the sealant as a way to secure layers so you can do parts that you have difficulty with. Apply blush using chalk pastels. Apply sealant to secure blush work. THIS IS COMPLETELY OPTIONAL. This is my own preference because it gives me a feel for the eye shape. I use color pencils to roughly outline the eye shape. It does not have to be perfect. This is a continuation of the step above which also makes it optional. Once I have my eye shape, I paint in the sclera with acrylic paint. Once the paint dries, I lightly add some shadows using color pencils and apply gloss to seal it. This step gives the sclera a translucent effect once the iris are added later on. Apply sealant to secure previous layer. You could combine the steps from this layer with the previous one if you want to “skip” a sealant layer. It’s ideal to try and accomplish your face up with as little sealant layers as possible. For help on drawing eyes, just use the same techniques you would in painting eyes. The only real difference is that you’re drawing on a molded surface. The same applies for drawing lips. Add blush if you need to. This layer is optional. Do it if you have difficulty drawing eye lashes so that you don’t disturb the progress you made from the previous layer. Turn the head upside down to help you with symmetry. It also helps to count how many lashes you drew from the opposite eye so you can make sure that they match up. This layer is optional. Do it if you have difficulty drawing eye brows. Turn the head upside down to help you with symmetry. 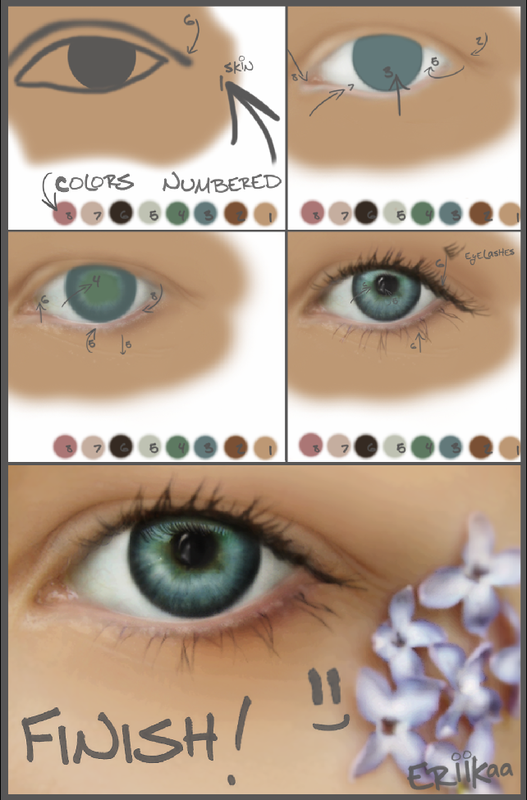 Add highlights to the eye and add more definition if you need to. Your repaint is essentially “done” at this point. Apply gloss to the eyes and lips as finish. Thanks for the tutorial, I was looking for something that would help me to make my dream come true, to be clear and step by step. Thank you for taking the time to give us step by step how to make a repaint. Thank you so much! Your articles are really helpful. And thank you for replying. Are you supposed to wet watercolor pencils during a doll repaint or no? I’ve been wondering this forever! Personally I don’t wet my watercolor pencils as I like them sharp and pointy. It’s easier to control the lines when they’re dry. You can wet them if you want to and if it makes it easier for you to create the effect or lines that you’re looking for. Can I not apply sealant? what makes the sealant on doll’s face sticky? I leave it dry overnight, but still. Also, when I started drawing the face (derwent watercolour pencil), it just scratch off the sealant no matter how soft I go. Hi i am so appreciative for all your helpful information! I have a question i apologize if i missed the information on your site I tried to read through everything, I know you use msc for priming now after you used a gloss for eyes/lips what brand gloss do you use? Can you use msc for priming and finish coat and then go over only eye/lip area with liquitex gloss varnish or would mcs and liquitex not work together? Thanks so much, i’m confused what to do. Yep, you can use MSC as a primer and finishing layer (after all the painting is done as a protective seal) then use liquitex gloss varnish over eyes and lips to give it that shiny sheen. Hi! Is it really really necessary to spray sealant before using prismacolor pencils on a disney animator doll for example??? As long as it’s soft vinyl (same as that squishy Barbie head or Monster high), yep. these materials are applicable. Check out my other blog articles. Quick question: My sealant keeps getting bumpy and uneven. Like, it’s not even smooth, so I have to keep removing it. Any advice for what to do here? If you’re using something else, it’s best that you contact the manufacturer. They should be able to help you with the particulars of their sealant’s behavior and how to manage it. Some sealants do tend to be super sensitive to temperature, humidity, or any number of conditions. Sometimes this info is written in the bottle but if not, just contact the manufacturer. Oh okay thank u☺️ what size brush would u go with for the eyelashes & eyeliner? I use a size 0/30 brush most of the time but you can use whichever size you feel comfortable with depending on the style of eyelash or eyeliner you want. It’s usually better to use a small brush for control and accuracy. And lots of patience. hi again! i just have another question i hope you don’t mind answering, for the blush, could you use soft pastels instead? also, does it have to be the powdered kind? i have both chalk and soft pastels but only soft pastel in powder format. thanks again! Depending on the style I’m going for I will use watercolor pencils or a paint brush. Paint brush tend to do a better job for anything that looks fine and delicate. Hi! I absolutely love this tutorial! i just have a couple of questions i hope you don’t mind answering! okay firstly, when painting, is it wise to thin out the paint? if so should i use a paint thinner or just water? secondly, what parts would mainly need to use the thinned out paint? Thanks and i hope you can reply ASAP! I’m self taught so I have a lot of difficulty explaining a lot of how I do things. I don’t like to share my own method (style,techniques) either. Much of the techniques I have is perfected through a lot of practice. yes, it’s always a good idea to thin paints. Whether you use thinner or water depends on the medium that you’re using. There’s a lot of useful videos on Youtube that can give you instruction on when, why or how to thin paints. Parts that need to get thinned out depend entirely on your own style and preference. I always use them dry just like I would an ordinary watercolor pencil. I haven’t used pencils much these days so any new recent dolls are mostly painted or blushed with pastels. I’ve seen water color pencils and *water soluble pencils,* since the water solubles tend to be better quality brands I was wondering if you know if they will work for face ups? I think they’re sometimes called aquarelles as well. As long as it’s not oil-based, they’re usually safe to use on vinyl. Most artists I know of stick to “water color pencils” but a quick little google-fu doesn’t seem to differentiate between watercolor pencils or water soluble pencils. They seem to be treated as the same type of medium. I apply the pastels dry (I’ve never heard or seen anyone use it wet. I’d be curious to know why). Highlights are usually acrylic for me. My question to the eyelashes eyebrows what they use sorry whom I ask stupid :/ is a kind of gel pen? and it may be possible times to make a video tutorial? The translator seems a little broken so I’ll do my best to answer your questions. For drawing eyelashes and eyebrows, I use watercolor pencils or very tiny brushes (anything below size 10). I can’t do video tutorials at this time since I don’t have the proper equipment. Hopefully that’s a possibility in the future. Thank you for the suggestions, they are duly noted and thanks for dropping by! You have to apply/use watercolor pencils or pastels after MSC has completely dried. It takes about 30 minutes to an hour for MSC to completely cure. If you’re referring to the pencils, I personally use them dry. I’ve seen some artists use it wet. I guess it depends on what your preference is or what you’re comfortable with. *////* i love you so much!!!! I was so lost in my repainting process, because the pencils don’t work directlly on the plastic face. Yeah, just as long as you use the artist grade type. I think they come in several versions. Just ask your art shop expert or consult the package for reference. I like using Prismacolor pencils (only because I’ve used them for so long) but Derwent is a good alternative too. Just a quick question, hope you don’t mind. Do you thin your acrylics with a flow-aid type product, or use them straight out of the tube/bottle? 🙂 I’ve seen some people say thinning is essential, some say not to bother…? Thanks so much in advance! Your repaints are really an inspiration! Yes, thinning is absolutely essential! I kind of thin paint intuition but depending on the situation, I’ll use water or medium or a combination of both to get the necessary consistency or effect. The end result or consistency really depends on your own preferences. As much as possible, I’m obsessive about making the brush strokes as invisible as possible. Could you use watercolor prismacolor pencils exclusively or would acrylic paint be necessary(like doing the sclera)? You can use prismacolor pencils exclusively. For the tutorial example, I used acrylic because it gave a shiny property or effect. Do you dip watercolor pencils in water before you apply or just use them dry? Nope, I just sharpen them often to get fine lines. I use them dry. It’s really important that you apply the sealer properly so pay attention to weather conditions to make sure that it’s on right. You want the “teeth” for the color pencils to hold on to. Sometimes you cannot get a “solid” white until after 2-3 coats of drawing the sclera. If color pencils just aren’t doing it for you, use white acrylic paint. You’ll need a very thin and tiny brush to get a smooth surface and you may need to apply several coats to get it completely white. If you pay attention to many of my repaints, the ones done in watercolor pencils don’t have a solid white sclera. The three dolls I released recently were done in acrylic and they do have solid white scleras. This is extremely helpful, thank you for sharing. I love your repaints. previous post: MH Repaint Part 2: Let’s Paint!